The worry stone has long been used in human cultures throughout the world as a cognitive behavior therapy technique to help ease anxiety and reduce stress while reprogramming the brain to replace a harmful or self destructive habit with a healthier one. Simply hold the worry stone between the thumb and forefinger of either hand gently rubbing the stone with the thumb to help quiet anxious thoughts. Combining positive affirmations with the utilization of a worry stone may increase coping skills and result in changed behavior. 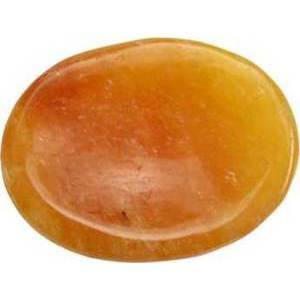 This is a sculpted piece of Yellow Topaz shaped into a worry stone approximately 1 inch by 1 and 1/4 inches by 3/8 inch.